Giger had of course spent much of 1978 in England working on the movie Alien. 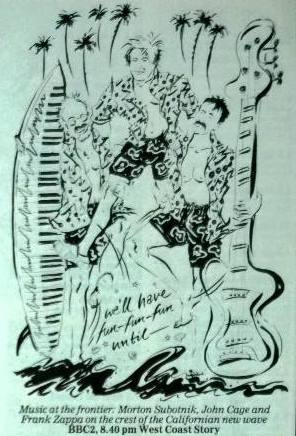 Perhaps Giger was supposed to have liked the surfboard merged with the keyboard and the idea of the famous musicians depicted in the illustration, Morton Subotnik, John Cage and Frank Zappa on the crest of the Californian new wave. So, what you have in the West Coast Story illustration is the banana shaped surfboard and you have the upper part of that shape to the left of the centre, and also you have the huge guitar and that's stretching across the centre of the ZDF painting. 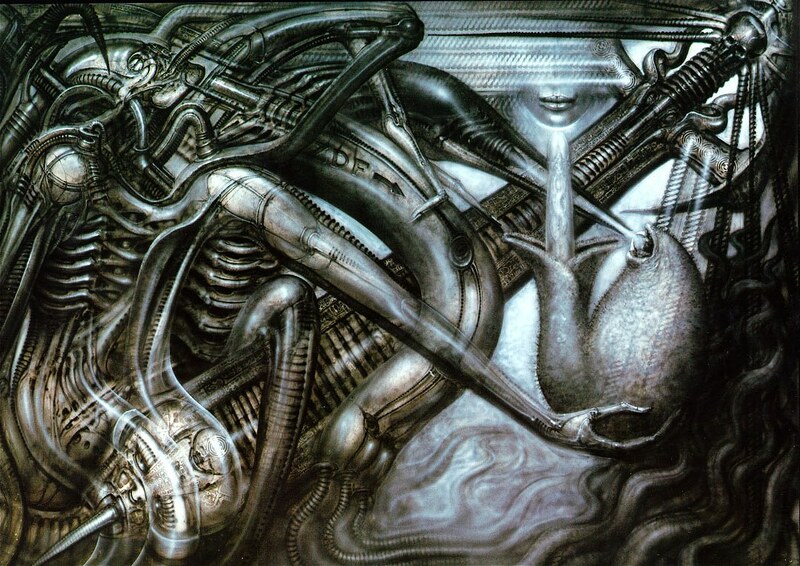 Giger has put a palm on the top of the guitar and turned it into tendrils emanating from a skull. The water at the bottom of the illustration looks like strange squiggles of blackness and Giger has turned them into dark tentacles across the painting. A spike appears to be sticking out of the bottom left of the surfboard as the fin and perhaps this has been transformed into the spike tongue sticking out of the face at the bottom of the guitar in Giger's painting.